The silver perforated paper used for this Sparkler shines like a mirror. 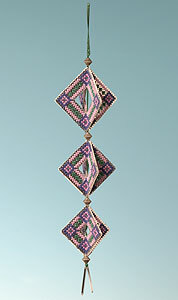 The simple design is worked in green, mauve and blue, and the three diamonds are threaded with green ribbon and silver beads, with silver bugle beads hanging below the diamond shapes. When complete the decoration is about 26cms long.